Discussion in 'Cars in General' started by GTPNewsWire, Apr 25, 2018. This article was published by Joe Donaldson (@Joey D) on April 25th, 2018 in the Car Culture category. I hope this show doesn’t take itself too seriously with the secret government organization, evil world-dominating criminal organization and street racing. I hope this show goes full-on troperific like a Saturday morning cartoon. Then it would be an enjoyable watch. I’m not sure where this will place on the scale of maturity, but that’s what made Battle Force 5 an enjoyable watch sometimes, even though that was a kid’s show. If it’s a silly concept to begin with, don’t be a serious show. Embrace the tropes. Apollo440, Just The Stig and crooky369 like this. First thing I thought When I read this was the “c.o.p.s” animated show. Spacegoat, 05XR8, girabyt3 and 11 others like this. Please stop creating animated shows for everything. Why couldn't it be more like the first movie? Saving the world has been done to death as of late and the first movie actually made some kind of sense. Apollo440, crooky369 and Flerbizky like this. Spacegoat, CinnamonOD, HarVee and 7 others like this. I think it will be more along the lines of the first movie. There'll be less violence and more racing since it's a "family" show. Seeing that all 8 films are a 12 in the uk, guessing it isn't aimed at kids. Not toddlers, but slightly older kids. Probably around the same age range as Star Wars: Clone Wars. Expect a breakfast cereal tie-in next, whore out the franchise for all it's worth. Just for kids who boost cars and steal dvd players, then later on stealing kingpins cash. The image in the article looks like a GTA V screenshot. It seems Netflix is dabbling in Machinima. I think your profile pic answers your question perfectly. Bad yugioh jokes aside, I'm hoping it's at least watchable. It'd be nice to have something car friendly for casual viewers on netflix again now that they took down Top Gear. It's a rather bad screen capture since the was the only image that Dreamworks put up. I'm guessing the production quality and models will look better on final release. Next there will be Fast and Furious toaster pastries. I'd expect something like an energy drink first. If we're talking food tie-in deals then Uncrustable tuna sandwiches are a must. Mayonnaise separates in the freezer. When they said animated I was hoping for more of a comic book / anime style, not horrid CGI video game style. Just The Stig, bremics and guywithanAE86 like this. All this talk about beating old horses and milking dead cows, yet I'll bet few to none of you feel the same way about Harry Potter or the MCU despite both of them putting out twice as much in half the time. Besides, you probably played the PS2 game (which in reality was the sequel to Street Racing Syndicate) or have sat down on one of the arcade machines during your travels abroad. That's how a franchise works; slap your name on enough tangentially-related crap and more people are likely to buy into whatever it is you're selling. But anyway, newsflash: the second Universal noticed how surprisingly profitable the original film was in a field largely comprised of duds and breakthrough international successes thoroughly trumping anything from Hollywood, trying their luck with a sequel that only had one connecting main character and somehow managing to strike gold a second time in spite of colder critical reception was the second they sold out. There was no reason to make a second film, the first one went out and did far more of a job than they bargained for. Then they made Tokyo Drift which was a tremendous bomb that wasn't even supposed to have the Fast name bolted to it due to the complete lack of anything from prior installments. Were it not for Vin worming his way back into the franchise at the very last second of TD it would have ended all the way back in 2006 as three forgettable non-sequiturs. By the time it came out on DVD the world had pretty much moved on from the tuner scene; Pimp My Ride went from WCC to the far less memorable GAS and got cancelled not long after, the next NFS was set on closed course professional racing and the only game that focused on being an Underground clone in that timeframe was Juiced 2, which likewise bombed. To try and keep what was almost certainly dead alive, they tried something different. Instead of just "fast carz lol" they decided to give it some plot, a very odd thing to do when you're four entries in and your previous entry flopped, but they made it stick in the end. 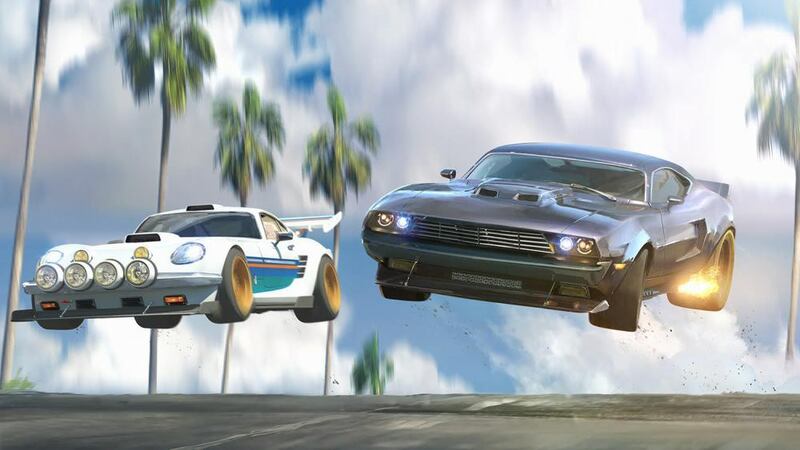 Though the fourth one wasn't looked upon fondly (probably because it still tried to be a serious film about street racing instead of embracing its obvious unrealism), #5 followed by #7 are considered to be the biggest successes of the franchise to date, both from a critical and commercial viewpoint. On the whole, I'm not particularly looking forward to it (unless they get whoever wrote the storylines for the Hot Wheels series) and feel the best time they could've done something like this was after the second one, basing its style off the credit sequence. Also, that's supposed to be a Z? Thought it was an Alpine with a wide bodykit. Spacegoat, Tunerguy21 and CLowndes888 like this.